The pine paneled dining room boasts an excellent view of the Oswegatchie River. In warmer weather, we open the screened windows to allow the sound of the river to fill the room. 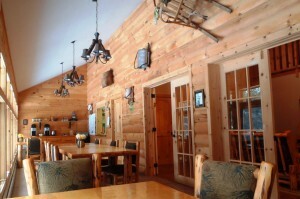 Coffee is hot and ready to go first thing in the morning and tea and hot chocolate are always available. 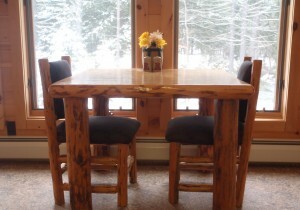 The skip-peeled lodgepole pine tables and chairs can be spaced individually or joined together for a group meal. Seating capacity: 12.